At some point, every expecting mom hears about how eating dates during pregnancy is the thing to do. But do you really know why? In this post we explore why they’re good for you and baby, and why you should start (if you haven’t already) eating dates now! Note: I suggest getting some good quality organic dates that aren’t processed with a bunch of junk. I get the Terra Delyssa brand from Costco. If you can’t get them from there, another comparable brand is Wild & Raw and you can purchase them online. You can get these dates delivered to your doorstep today with Amazon Prime. By using my link, you’ll get a 30 day trial for Amazon Prime for FREE! Like the Terra Delyssa Dates, Wild & Raw dates are: Organic, kosher, non-GMO, gluten-free, sun-dried, pitted, unsulfured, with no added sugar and preservatives. Sugar- Have you ever tried dates? Not only are they delicious, they’re super sweet. They kind of remind me of chewy toffee. But unlike toffee, the natural sugars found in this fruit are actually good for you! They break down quickly and give you a jolt of energy without having you crash an hour later. Pregnancy can be is draining and the healthy fructose found in dates will give you the energy you need without the extra junk. You can back a bunch of these in your hospital bag so you can have them on hand to snack while you’re in labor. They will help empower your body for your baby’s birth! Fiber- Helps keep your bowels running smoothly and reduces constipation. If you’re concerned about pooping during labor, make sure you get in enough fiber so that you aren’t backed up! Folate- Dates contain this natural B-vitamin which is important for replicating DNA, producing new cells, and supporting nerve and immune functions (crucial for your unborn baby!). It can also help prevent birth defects and anemia. Iron- This study shows that many women go through pregnancy being iron deficient! Ensuring proper iron intake is important as iron plays an important role in a number of physiological processes such as the production of extra red blood cells for both you and your baby. If you are pregnant and find yourself feeling weak and lightheaded, you may have low iron stores. If you’re iron gets low enough that you need to supplement, check out the Floradix Liquid Extract Formula. I’ve had great results with it in the past (much better than those gross iron pills). It’s safe for pregnant & breastfeeding mamas. It’s also vegetarian-friendly! Ensuring that you are consuming adequate amounts of iron will also benefit you during birth because you won’t feel exhausted, and will be able to power through your birth. So do your body a favor and prepare it for labor by eating dates! They may be small, but they are chock-full of vitamins! Listen, childbirth is not easy. Especially if you go natural like I did…twice……girl! Thankfully, with both my pregnancies I never labored very long. With my first I labored at home and got to the hospital 9cm dilated, and with my son, I had no idea I was actually laboring all day…long story short, I casually strolled into the hospital only to find out I was 9cm dilated! I had no idea I was in labor. I would’ve had him at home if my mother and midwife didn’t insist on me going in! Anyway, the last thing you want is a long labor…especially when you decide to go natural. Though very much doable, the entire process is quite painful, but most of all it’s exhausting. Giving birth is hard work! effective in decreasing the length of labor processes and reduced the need of oxytocin for labor acceleration. Dates are linked to higher rate of spontaneous labor (no artificial induction of labor). According to this study, the rate of spontaneous labor was much higher among the pregnant women who ate 6 dates per day in the last 4 weeks of pregnancy (compared to the women who ate none). 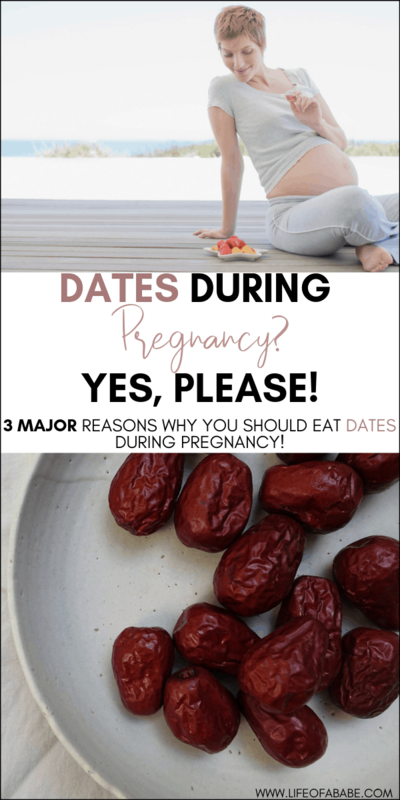 Eating dates throughout your pregnancy is a great way to show your body some love and to prepare it for labor. However, everything in moderation! Although they’re healthy, they’re still very sweet and you don’t want them to trigger any kind of issues like gestational diabetes. Eating dates (about 6 a day) in your last trimester is a great way to prep your body for labor. 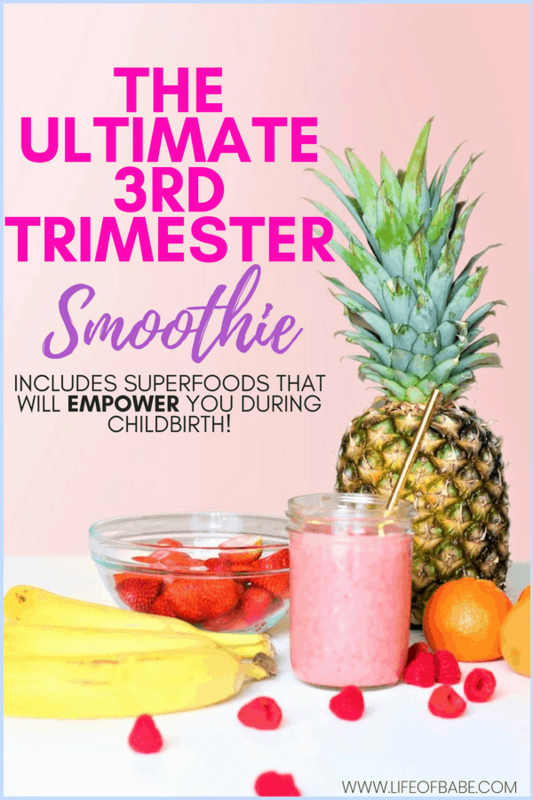 If you’re new to eating dates during pregnancy and want to know different ways to get some in your diet, check out this super easy and delicious pregnancy smoothie recipe! I even make date syrup for pancakes and waffles at my house. If you want to keep it simple, you can just eat them whole. I hope you enjoyed this sweet post! Feel free to drop me a line at heymallaury@lifeofababe.com or via Instagram. Fill out the form below to join my EXCLUSIVE email list. By signing up, you’ll get access to the Freebie Library for VIP Mamas (full of great resources), you’ll receive helpful tips, and get notified every time a new blog post goes up. Subscribe now so you don’t miss out! I will have to share this with my friend who is expecting! Great information here. 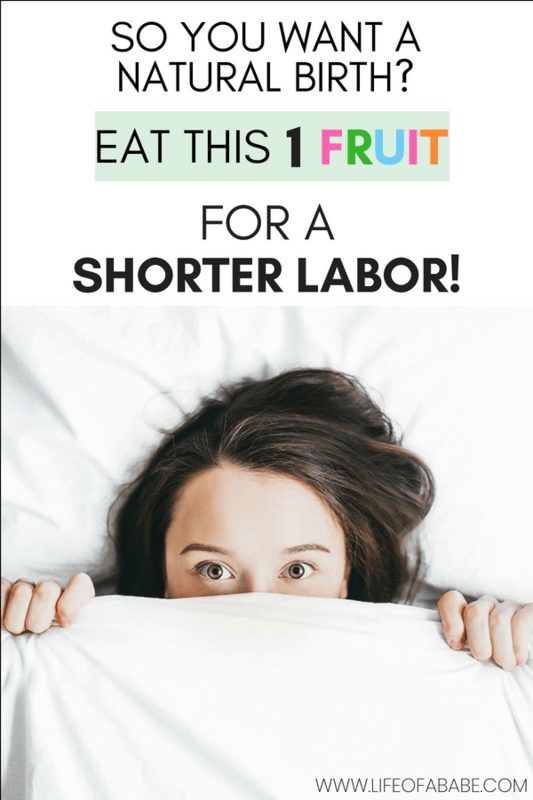 Is this safe to eat during the first trimester? I love dates! Hi, Mallaury! I enjoy dates in oatmeal, smoothies or just out of the container. 🙂 I have always appreciated the nutritional benefits of dates. It’s good to know the benefits of eating dates during pregnancy and their effect on labor. Thanks for writing this informative blog post! I look forward to reading your next post! Thank you SO much Karla. Yes, dates are delicious and they are so versatile (on top of being healthy) which is why I love them. I feel like anyone can like dates because you can use them in so many ways. Thanks for reading and thank you for your support. Dates during pregnancy are awesome! Such a Great and healthy addition to the prenatal diet!